Puppet performances of various types were popular in China. There were several forms of puppet theater in China. It isn’t known which developed first. The Chinese puppet theaters come in four forms: marionettes on strings or wires, rod puppets, shadow plays, and hand manipulated glove-type puppets. Marionettes on strings or wire like the old time Pinocchio or as in the picture to the right were once popular in the China before the advent of motion pictures. Marionettes were usually carved from pieces of wood, and the assembled parts are hung on strings. 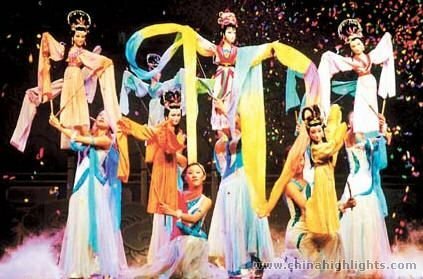 Chinese marionette plays are mostly performed in the open air without a curtain to conceal the puppeteers, unlike the common practice in the West, and spectators can see both the performances and the performers from the three sides of the stage. In the West, the audiences usually expect the performers to be hidden. There were religious aspects to Chinese marionette plays, and there might still be to some extent. Marionette performances or other types of puppet theater were often outside of temples or shrines and used for instruction of religion. 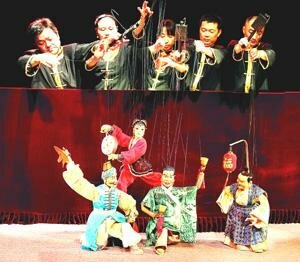 Chinese rod puppets are puppets that are manipulated by three rods as shown in the picture. The puppets may be small or even life-size. Performers used to wear special traditional theatric robes with big sleeves so that the rods were somewhat hidden, but modern performers tend to let their hands and rods show. One rod is attached to the puppet’s head. The other two are attached to the arms. The legs are left without rods. The head of the puppet is usually hollow and is carved from wood, and the performers can move the eyes and mouth. The hand rods may be attached to the performer’s wrists or elbows. Rod puppetry is still a little popular in China. At a time when there was no flat-screen TV, people entertained themselves in the evening with shadow puppet theater. Shadow shows were once a popular form of entertainment, and they were also used for religious and instructional purposes. 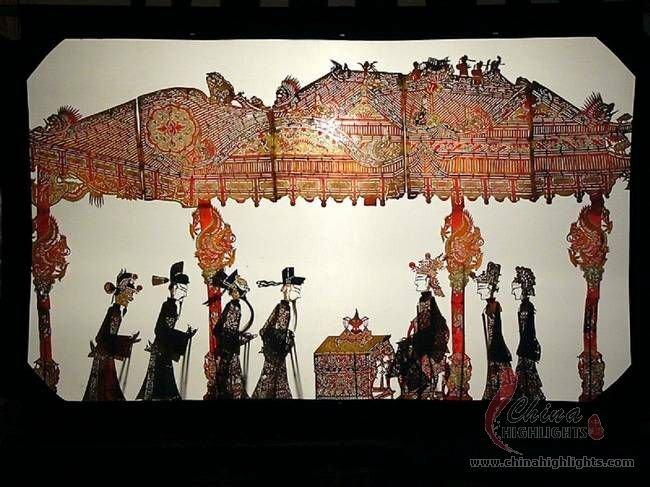 Simple to perform, dramas were played out on screens or walls for thousands of years to entertain and instruct, and shadow theater is still performed in China. A simple lamp and a thin screen was all that was needed for a stage. Things like people, animals, furniture, pagodas, walls and plants were shown on the screen by placing figurines or figures made of cardboard or leather in front of the lamp. The lamp illuminated the screen from behind, and people could move little figurines around for theatrical performances. With added music and sound effects, the performances could be quite entertaining if they were well executed. These were ancient dramas or cartoons, and they were even colorized for added entertainment by using colored translucent figurines. The lamp light cast a colored shadow. Glove-type puppets like the "Muppets" are quite familiar in the West. Glove puppets are still a common toy there. 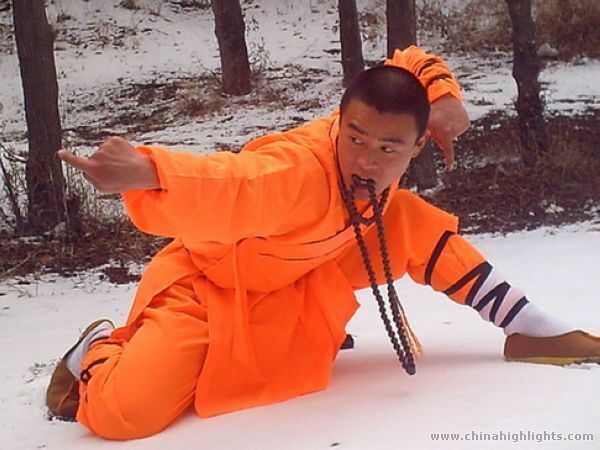 These were also popular in China since ancient times. In contrast to shadow plays that were staged even in rough Mongol encampments or poor primitive villages, the stages for glove-puppet theater were often finely crafted. There were miniature palace courtyards with richly decorated buildings that for example had carved rafters and golden roofs. Nowadays, glove puppet plays are popular in Taiwan. 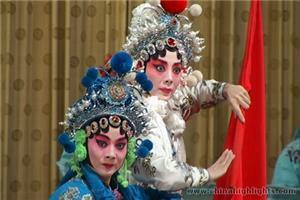 China Puppet Theater (中国木偶剧院 Zhōngguó Mù&apos;ǒu Jùyuàn) is at 1 Anhuaxili, Beisanhuan Lu, Chaoyang District, Beijing. 朝阳区北三环路安华西里甲1号. There are a variety of puppetry performances. For particular shows or for booking tickets and to find out what is playing, let us help you with the travel arrangements. Contact us. We are only a click away. Shichahai Shadow Art Performance Hotel (什刹海皮影文化主题酒店) is at 24 Songshu St, Xicheng, Beijing. 西城区松树街24号. This theater specializes in shadow puppet performances. The theater is in a modern and tastefully decorated building. We can help you catch a show. The Shanghai Puppet Theater (上海木偶剧团) is at 5/F 388 West Nanjing Road, Shanghai. 黄浦区南京西路388号, 仙乐斯广场5/F. 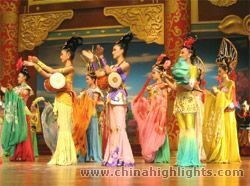 This theater has been entertaining families for fifty years and produces both traditional Chinese puppet shows and other puppetry art forms from around the world. 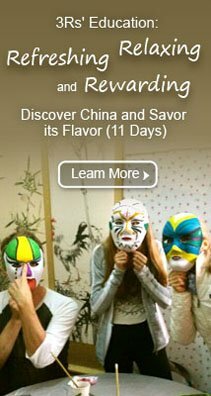 We could help you make a China tour including a visit to a puppet theater. Tell us what form of puppetry you want to watch.